GABA is an important neurotransmitter in CNS, which controls most of the functions of the body and mind. It’s has been implicated in several health challenges such as anxiety disorders, insomnia, or depression. In this poster, we show pharmacological modulation of GABAAR using QPatch and Qube 384. 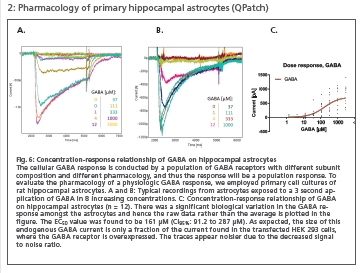 The study includes a characterization of the heterogeneous GABAAR population of cultured primary hippocampal astrocytes and an evaluation of the GABAAR clone ɑ5β3γ2. The results demonstrate the feasibility of performing GABAAR-targeted drug-screening on Qube and QPatch, and we also introduce optopharmacology as a viable application possibility for high-throughput pharmacological experiments.